We have now entered the part of pregnancy when the products start to arrive. Although our apartment doesn’t quite look like a Babies ‘R’ Us yet, we have acquired a few new items that would indicate the presence of germy offspring to a prowler. Although I doubt it, the risk of pilfering a laptop or an iPad tainted with spit up would hopefully gross him out enough to make him leave. A bassinet. We want Bebe to stay with us in our bedroom when she first arrives, and our glorified closet bedroom doesn’t have nearly enough space for a crib, so we asked for a bassinet for Christmas. And we got one from B’s mom! It is way cute. It has sqeaky little dangling sheep. 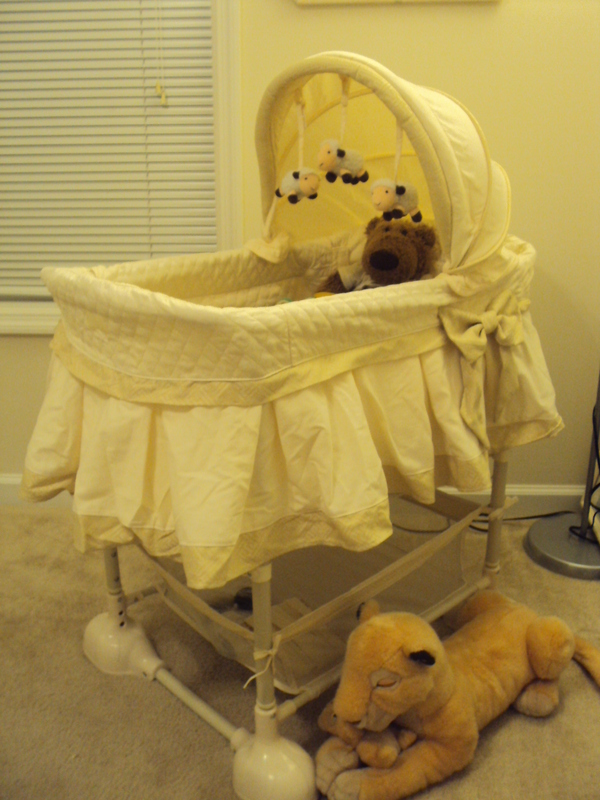 B’s Schlepp is currently occupying it and my Nala and baby Simba – received in 1995 from Disney World for the low, low price of $75 – are guarding it. As our own parents had to take second mortgages out on their homes to provide us with these premium stuffed animals in our youth, I have a strong moral obligation to get some mileage out of them. A combo stroller/carseat. Another Christmas present, my mom and brother went splitsies on this item. I cashed in my pregnancy chips and B got to put it together. I like it a lot based on the inherent value it provides in allowing us to leave our home with the baby. Granted, if we stay in Fayetteville, there will be very little for her to see and experience other than meth labs, but who am I to deny my baby the chance to see the world, albeit a world that revolves around Walmart customer service? 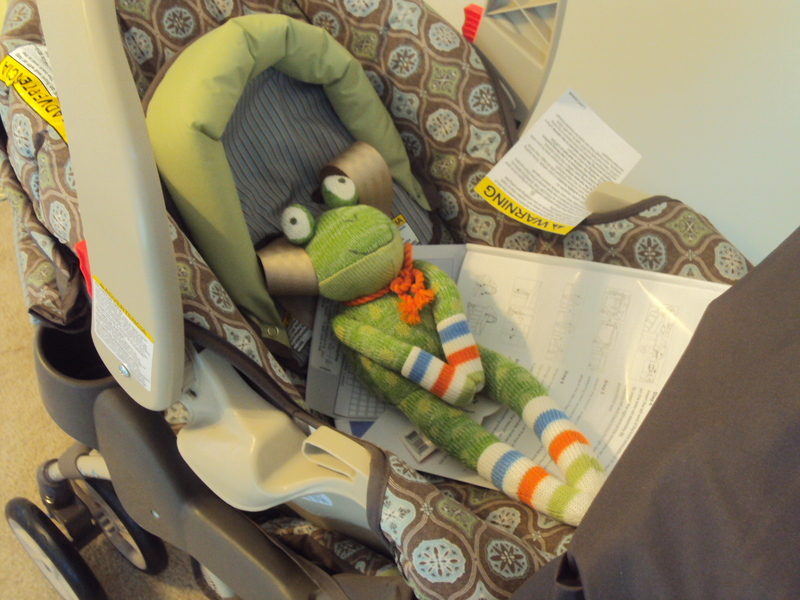 Holding her spot in the carseat is also Bebe’s first frog, who is currently unnamed. Our Froggert is “totes jeals” (his words) that this new frog has entered our home and is already wheedling its way into our hearts. My only *very, very slight* qualm with the stroller is its color scheme. We’re – oh, let’s be honest – I am selecting items for the baby that are somewhat gender-neutral. In Babyland in 2012, apparently “gender-neutral” is predominantly dusty brown. I really wish I could find more red and green items that weren’t designer. The Beebs has also gotten a whole bunch of onesies, blankets, and swadlers. They are piled up on a table in her closet, along with some beedy-eyed friends from our youth. They demand an offering of baby paraphernalia every time I open the door to the closet so as not to bring down curses on our offspring. I throw down a teething ring, a onesie, a pacifier – anything to ensure the safety of our home for one more day. Such haphazard, fearful throwing is the only way to explain the disarray of the closet. Sorry, kid. Mommy and Daddy have decided that whatever it takes for us to get a good night’s rest these days trumps age-appropriateness. The fact that an adult married couple sleep flanking a sheep that makes whale sounds? And that we don’t refer to Sleep Sheep as “it” but as “she”? Irrelevant to a discussion of our grasp on reality. Sure, we’ll get Bebe one for her own crib if she proves to need some assistance falling asleep. Begrudgingly. The original Sleep Sheep is OURS. 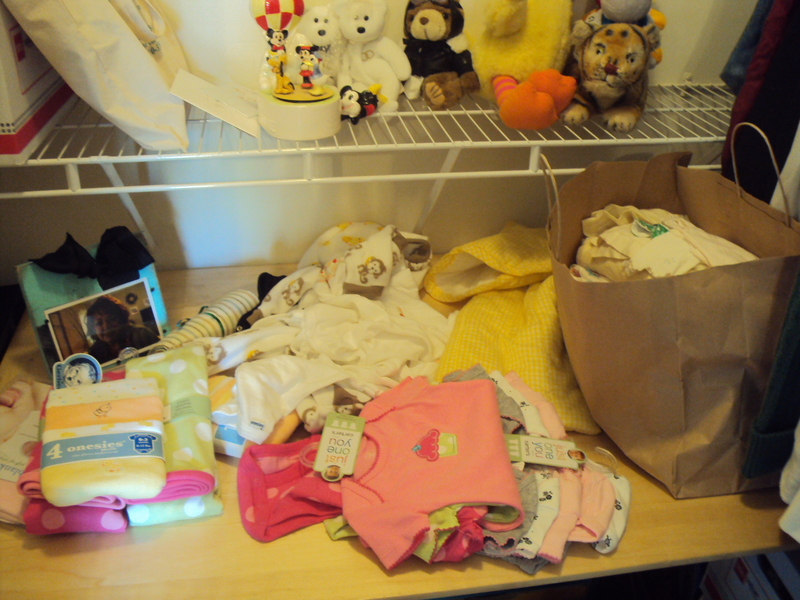 While on the subject of Stuff, I should also note that Bebe’s baby shower is in the works. Besfrinn Cameron’s mom Mary Beth is generously opening her home in Memphis to me and my menagerie in February. The only complication I can foresee in this undertaking is the custodial relegation of Sleep Sheep during the time I’m gone. B will be foregoing the festivities and staying back in North Carolina. Nevertheless, I am extremely excited about this event. Cameron is making the trip from Pasadena! Since this is likely the last time we’ll be together without husbands and children in tow for quite awhile, we are planning a sleepover the likes of which have not been had since we were seventeen. Activities on the agenda include parsing Smashing Pumpkins and Tori Amos lyrics, eating vast quantities of neon yellow cheese dip, and trolling AOL Instant Messenger to see which of our classmates would like to chat. In actual baby news, everything continues to go swimmingly. The whole ordeal of the blood glucose test is over and done with. I failed the initial screening and had to go to an off-site lab to have the full battery of tests run, but they turned out clear. The only alarming thing was that I evidently was not as grossed-out by the sweet drink they make you chug as 99.9% of the population seems to be. The kind they gave me just tasted like Kool Aid mixed by a three-year-old. I’ve had worse. Bebe continues to be kicking a lot and has recently added the hiccups to her battery of cuteness. Seriously, the fact that ittle-bitty-babbies get the hiccups in dere mommies’ tum-tums is so adorably sweet I can’t believe it! Sweet just like pure concentrated sugar syrup. My, how your tastes change when becoming a mother! We had a sleep bear. Hated it because it kept the kid awake. But if Sleep Sheep is your ticket to dreamland, indulge! We will! I will declare my love for this thing throughout the land, no matter how many sideways glances I may receive! Not my kind of drink at all! Glad it wasn’t too horrible. I agree. No corner of the world will be off-limits to her! Yay! I love the new look of the blog–very crisp and clean and lovely! And I am excited to see Bebe’s things! And I am excited about our upcoming sleepover! Hurray! Love you! PS: You are hilarious. Emily, this was so sweet ! Makes me feel like i’m in the loop with you and B and BeBe. Enjoy the weekend and MONDAY !! Thank you! You ARE the loop (I realize that doesn’t make much sense, but you know.) We’re going to Raleigh tomorrow and part of the agenda includes a trip to a certain food store to go on a shopping spree with a certain gift card. EXCITED!!! Way to plan! Thanks for the tip! Instead of a Sleep Sheep we have a “Soothe and Glow Seahorse.” Not as convenient to say as Sleep Sheep, but it does the job. It plays music mixed with like, ocean sounds or something? I don’t know. It’s weird, but it works, and it sounds hilarious when the batteries are about to die. It’s like some kind of slow-dying manatee. Hahaha! Well, if we ever get together for drinks, we’ll know what we will both be ordering up! The sound of mommy’s heartbeat kind of skeeves us out too, and I can’t imagine how bizarre it would sound slowed down! Definitely like a background track to Eraserhead and to be avoided. Ooh I love the new look ! Thank you! It’s cheaper than cutting and dying my hair. Now I’m the creepy stalker: I’ll be in Raleigh today. Beware. I am a bit jealous of your Sleep Sheep. Husband and I sleep with a stuffed Perry the Platypus between us (Santa brought the boys a Phineas a Ferb and a Perry, since there are only two of them, they gave us Perry to sleep with). Perry makes no happy sleepy noises at all. I think I liked my son’s lovey almost as much as he did. A soft, cuddly monkey called, “Cuddles.” Duh. Cuddles also had a friend named “Wuff,” (like “stuff), but Wuff was never as well-loved as Cuddles. We still have Cuddles; he sits in our room next to the big TV. 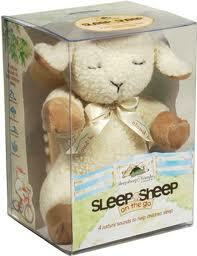 If Sleep Sheep doesn’t work for Bebe, try the Fisher Price aquarium that attaches to the crib. Daughter loved, loved, loved it. Nice lullabies and moving fish to watch as she drifted off. Then you get to keep Sheepie. I seem to recall babysitting for a baby back in the day who was also transfixed by the crib aquarium. I’d be transfixed, too! We are huge fans of white noise makers for EB. Hers projects a rotating scene for a night light and plugs in with a choice of sounds w/o a timer, so it goes all night. At this point she could probably stand to sleep w/o it, but our house is so small that it’s nice to have the sound buffer. You’re getting so close! Fun!! Yes! It is so much nicer to have a white noise maker than to have the TV or radio on all the time.